Vistawood is baby furniture manufacture in Malaysia. 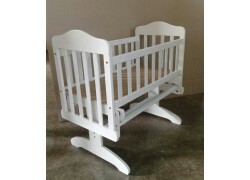 We supply baby wooden swing cradle. We export our swing cradle worldwide. Who don't like swing cradle? It's create the best mommy-baby moment if you own a swing cradle. Our wooden swing cradle follow industry baby safety standard. We have wide range of swing cradle. Enquiry our baby furniture. Our friendly staffs are ready to help. We accept OEM swing cradle.